Spring Peeper Farm: Ducks, clotheslines and Victoria Day weekend. The following picture is now off limits for me. I have been told by my hubby to not use it for awhile. Oh I miss it. But it falls off it's track at the other end and when that happens Dave has to climb on top of the barn and then put a ladder on the roof of the barn to reach the wheel and the clothes that have gotten stuck up there. Not the most ideal situation. I don't really want my hubby breaking his neck for a few clothes. Well Otis went to the big pasture up the road last week. Dave actually walked him there. A friend of ours actually stopped and said, "Aren't you supposed to walk your dog? Not your cow?" 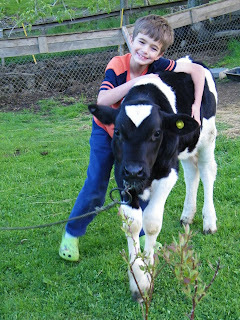 Dave said, "I don't have a dog, so the calf will do." Otis actually found a friend in the pasture. That night we went to visit him and he actually made friends with a larger Holstein in the pasture. It was kinda cute, since all the rest of the cattle were what I call meat cattle and a few Jerseys. But there was only one other Holstein in the bunch and they became friends. I wonder if cattle are prejudice? Ha ha. Pretty soon people are going to start calling me the crazy cat lady. We have a new addition to our cat family. It's not by choice. She kinda adopted us. This pretty stray has been eating the barn cat's cat food for months now and she's decided to become a bit friendlier. Well really it's amazing what a determined 9 year old and a couple of bags of cat treats can accomplish. So that means we now have 5 cats. Ugh. Dave went to the cattle sale a few weeks ago and sold the twins. Sniff, sniff...But we cannot keep them all. I didn't get much for them either. Bummer. 66$ for 2 twin goats. Not good. But while Dave was there he thought that he'd surprise us with a treat. 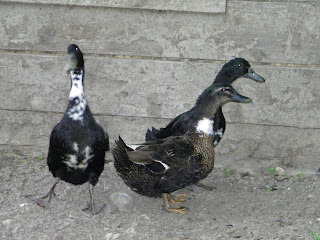 So please meet our 3 new ducks. Or as I call them, "Supper for the wild minks". One has a bum leg, but you can't get with 20 feet of them. They are really petrified of humans. Hmmmm.... 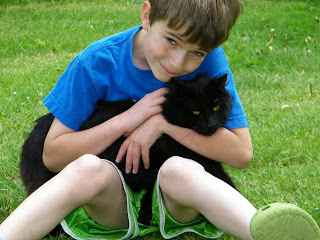 I wonder if a few bags of cat treats and a determined 9 year old would work on them? In Canada this past weekend was Victoria Day weekend. It was a gorgeous weekend. I was off work!! !YIPPEE for me! 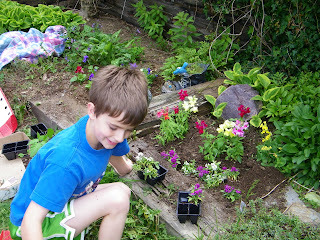 J. and I did some gardening. Well I have so much to blog, but it's going to have to wait for another post. I am having so many problems with blogger that it's now an extreme pain to blog. I cannot move my photos around on my post, so I have to save everything, open a new post, copy and paste the body of the post to the new post, then copy and paste the photos to the exact spot I want them in the new post. So I'm doing all my work twice. NOT FUN!!!! It's almost as bad as trying to make cheese! Which I'm trying to do again tonight. Yes, I am a sucker for punishment. I'm glad Otis is doing well and moving to the big pasture. Your kid looks like a natural with the animals. Who knows, he may be a duck whisperer.